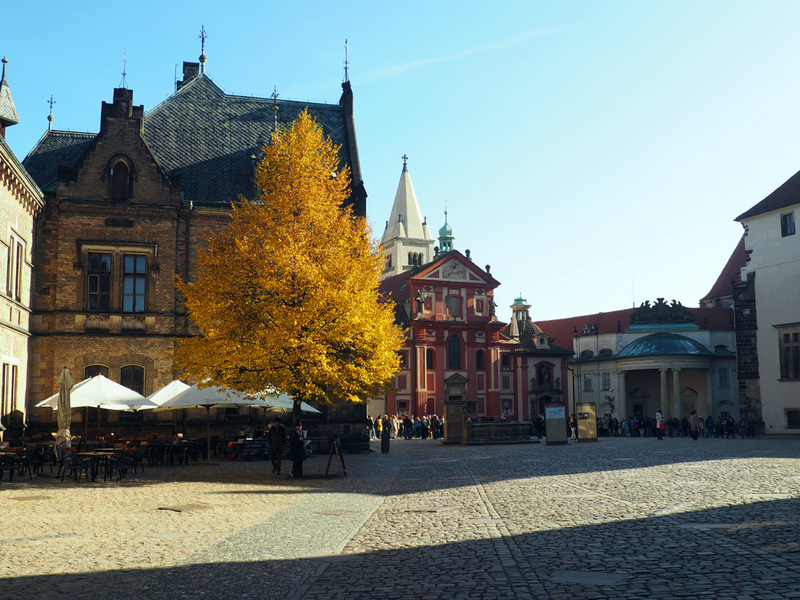 I’ve been a little off beat with blogging lately, so today’s post is a little after the fact – an autumnal Prague, going live in December. 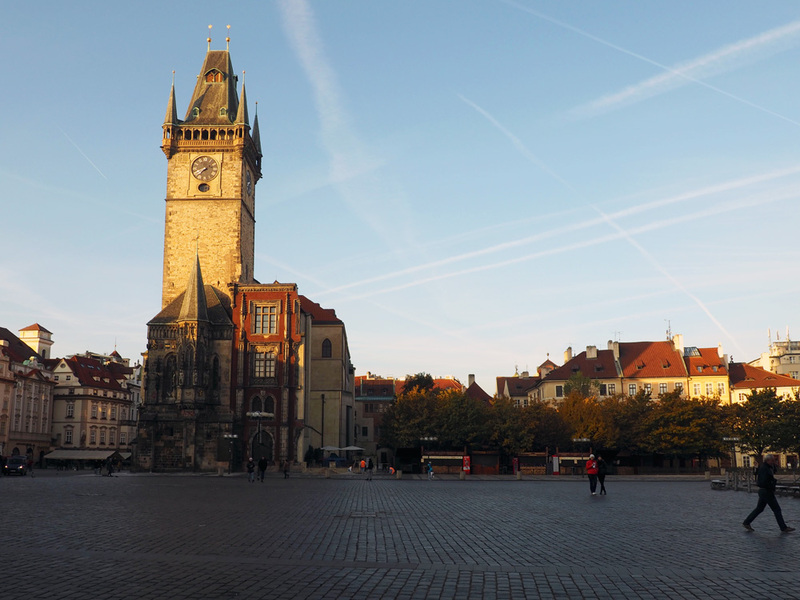 My second day in Prague dawned bright and early – I mean, seriously early. We were up and out by 7:30 am. If I have one tip for anyone visiting Prague it’s definitely to brave the wee hours and get up as early as possible. You’ll be rewarded with a relatively deserted city, the crowds of later in the day non existent. You’ll walk through normally packed streets and squares without seeing more than one or two locals, and can enjoy that beautiful feeling that you’re the only one awake in a sleeping city. 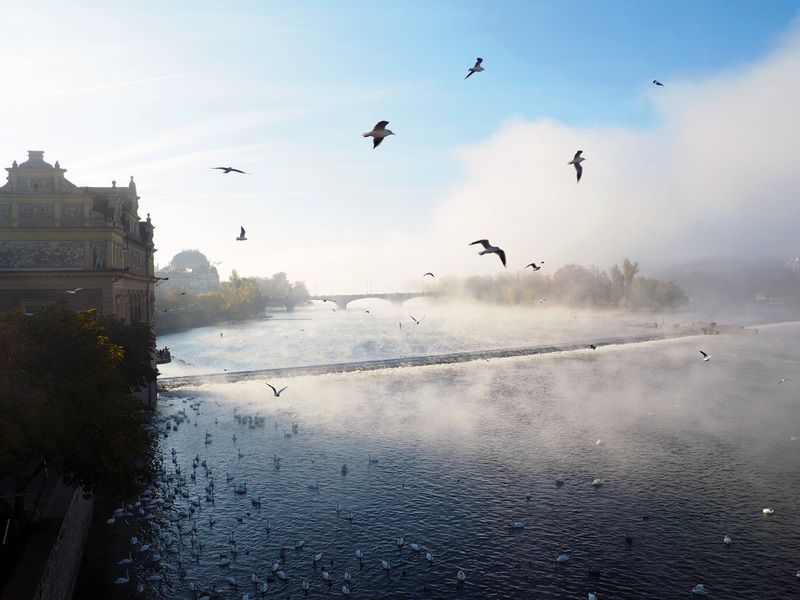 One of the best reasons to get up early in Prague? 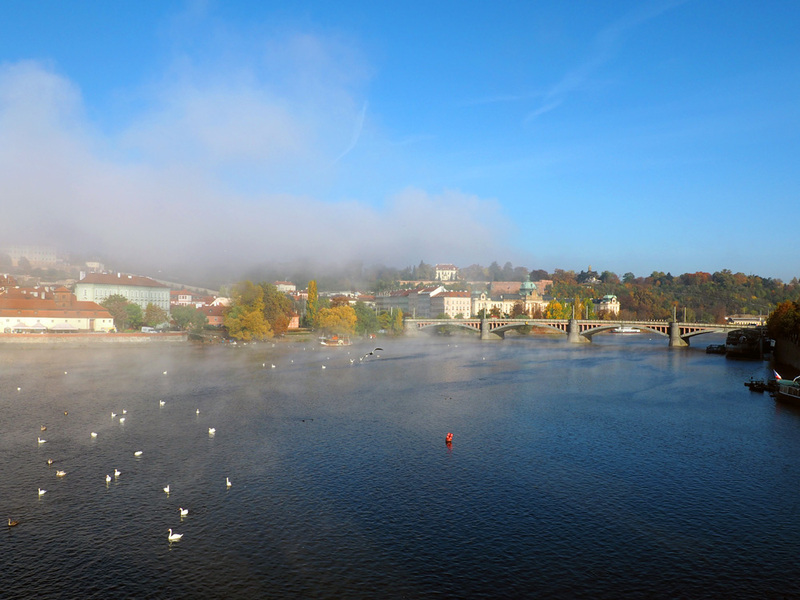 The opportunity to catch Charles Bridge – and actually see the whole thing! 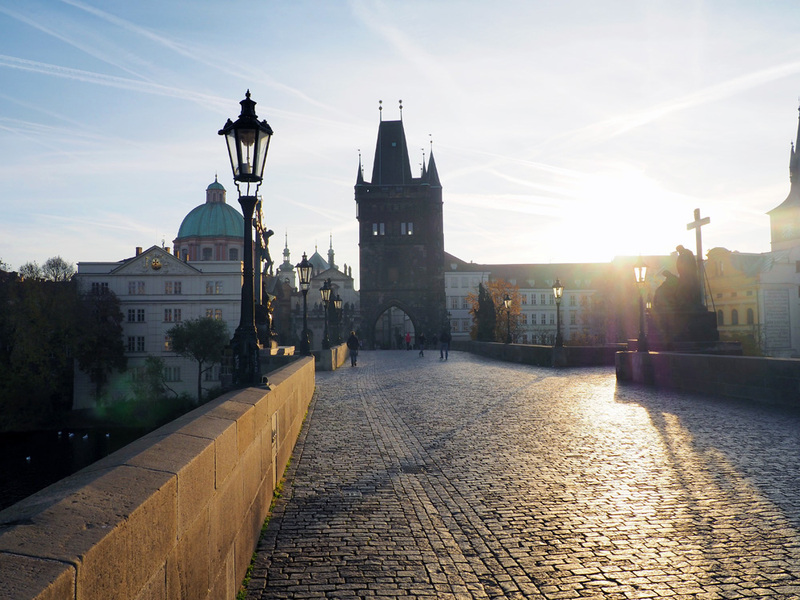 During the day time, Charles Bridge is a mass of people. Tourists, street performers, artists and vendors all vying for some space on the cobblestones. Early in the morning, these are all but gone. There are still visitors who had the same genius thought as you and woke with the sun, but they’re few and far between. This is the time to cross Charles Bridge! By the time we’d oohd and aahd over the steam rising off the river, the beautiful blue of the sky, the stunning architecture and the beautiful views, it was nearing 9am. Time to head up to Prague Castle! Built during the 9th century, Prague Castle is a sprawling complex of buildings and gardens – it’s the largest ancient castle in the world! It’s free to enter the grounds themselves, and the queue can get pretty long. When we arrived, relatively early on in the day, it was already snaking across the square outside. Stick it out – it moves quickly, and it’s worth it! Parts of the castle are paid admission. Don’t worry – the queue you see is just to bag check, with tickets being sold inside. 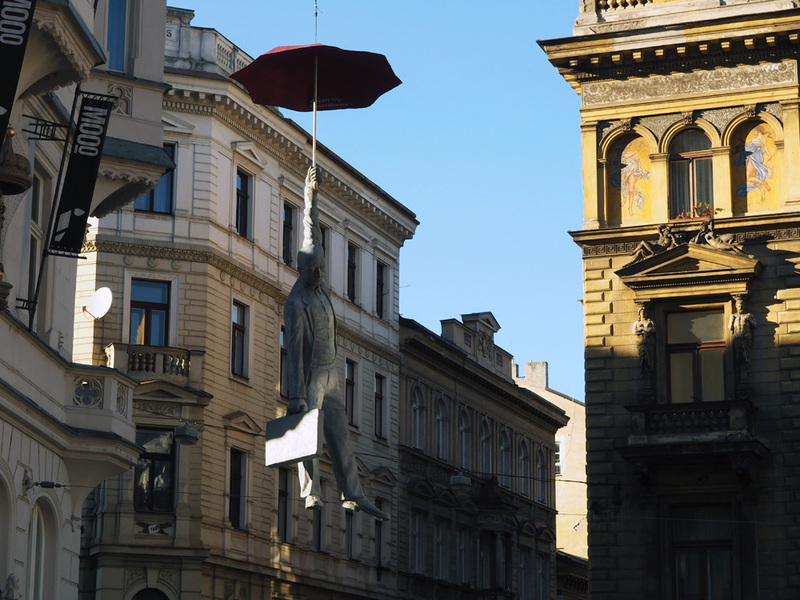 So this is a great free activity in Prague! We didn’t pay for anything once we were in as I was on a tight budget, and we were able to see a lot without buying tickets! 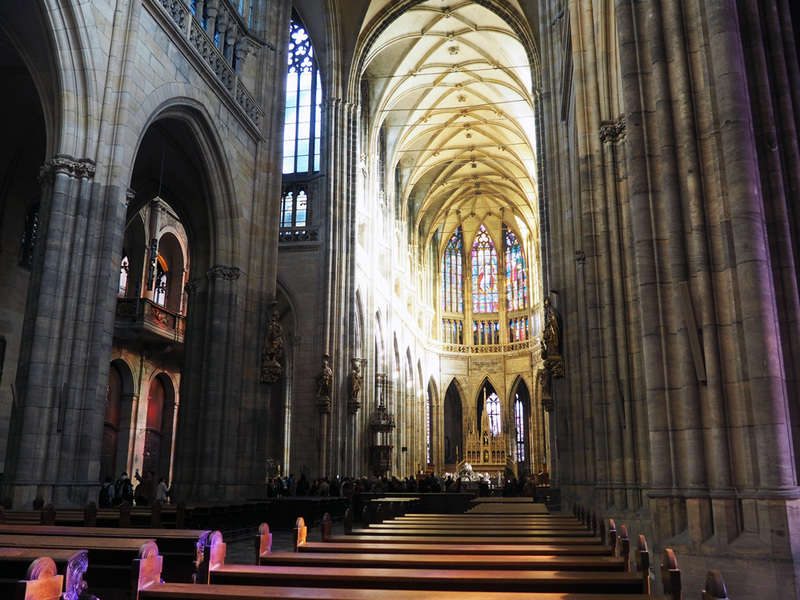 Take for example, St Vitus Cathedral (above). We were able to go in for free, but if you want to explore further and see the entire interior you’ll need a ticket. 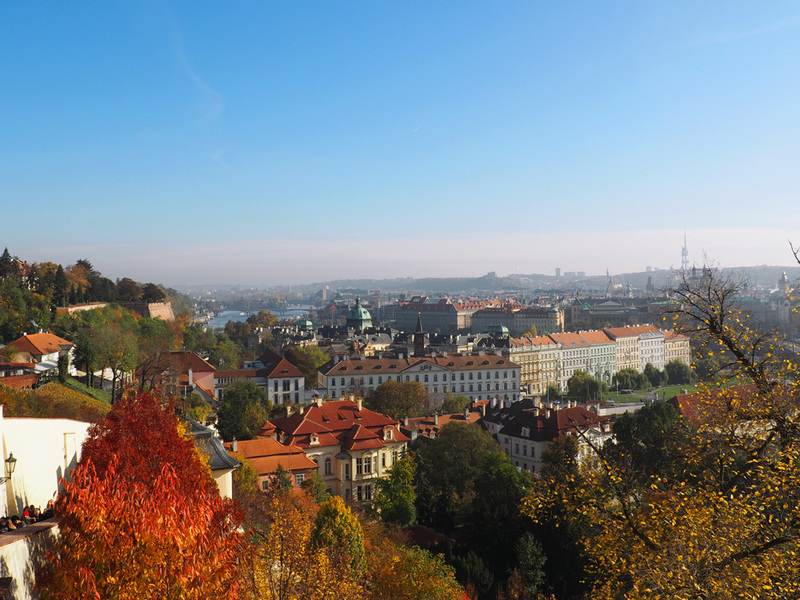 The views from Prague Castle are just stunning. 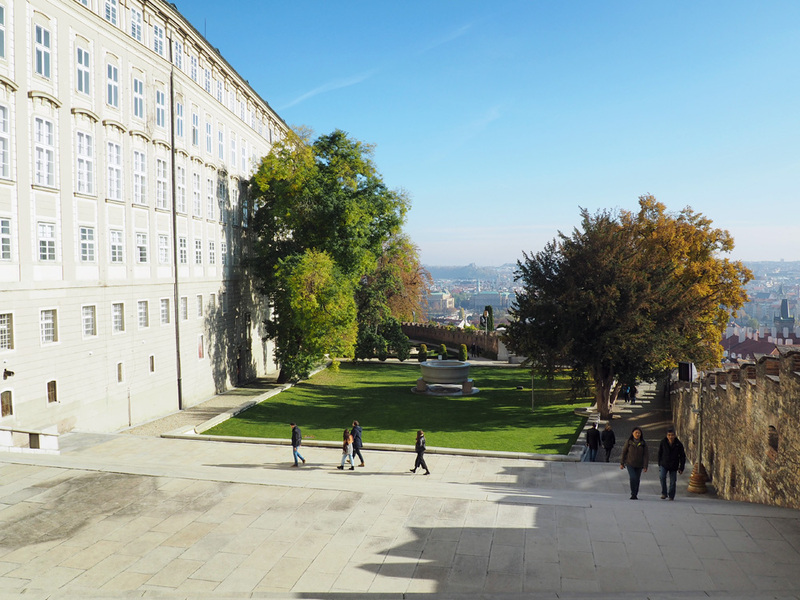 You can look out over the whole of Prague as you wander around the seriously extensive grounds, admiring the different style of architecture along the way. 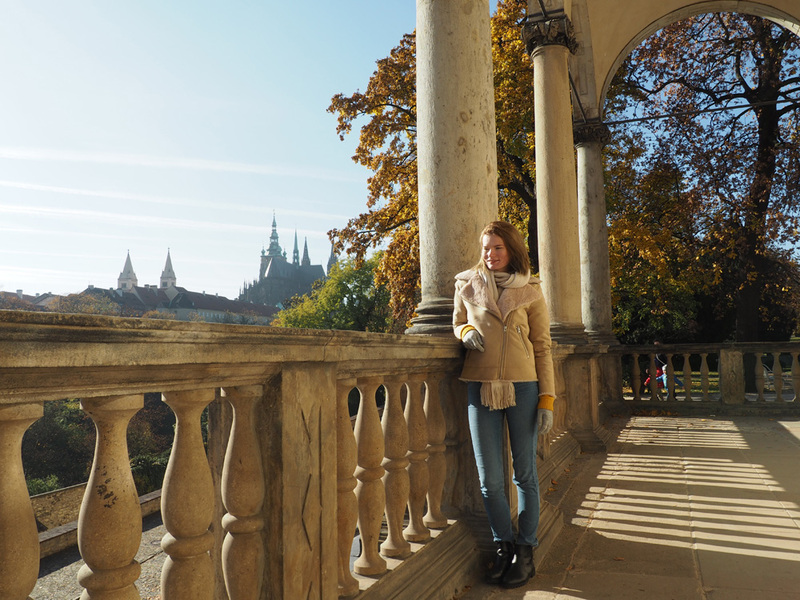 Prague Castle was one of my favourite things in Prague and I can’t recommend it enough; it will easily take up a full morning, so plan a bit of time to make sure you can take it all in. Having spent plenty of time exploring, I was in the mood for a more relaxed afternoon. On a recommendation, I headed for the Globe bookstore to seek out some reading material for the train ride home. This is probably one of the best bookstores I’ve ever been to, if only for the amazing woman running the shop when I visited! 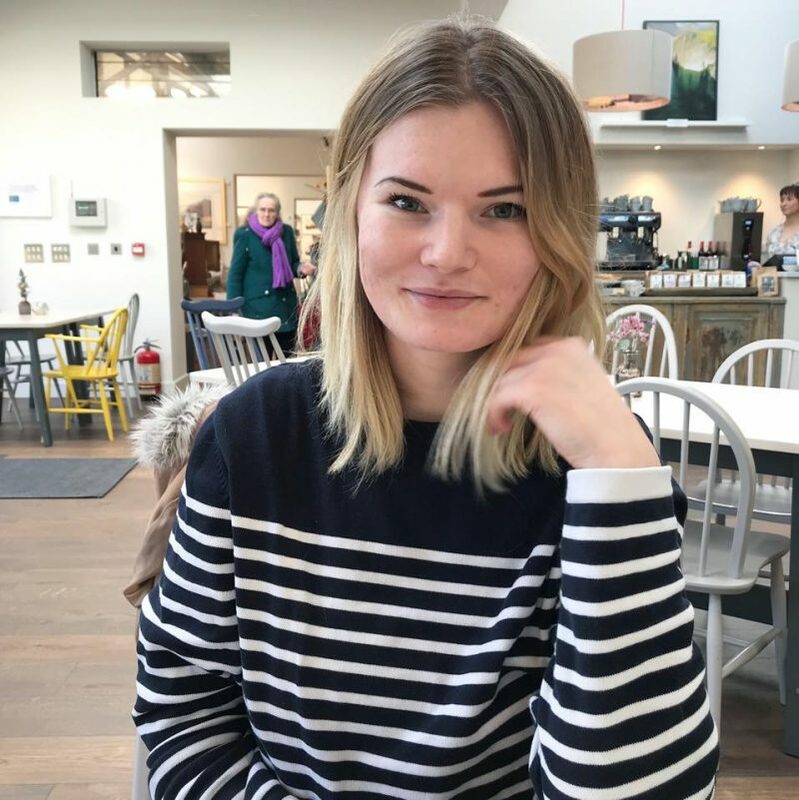 There’s also a café which I didn’t have time to visit but looked so cute – the perfect place to while away some time with your nose in a good book. 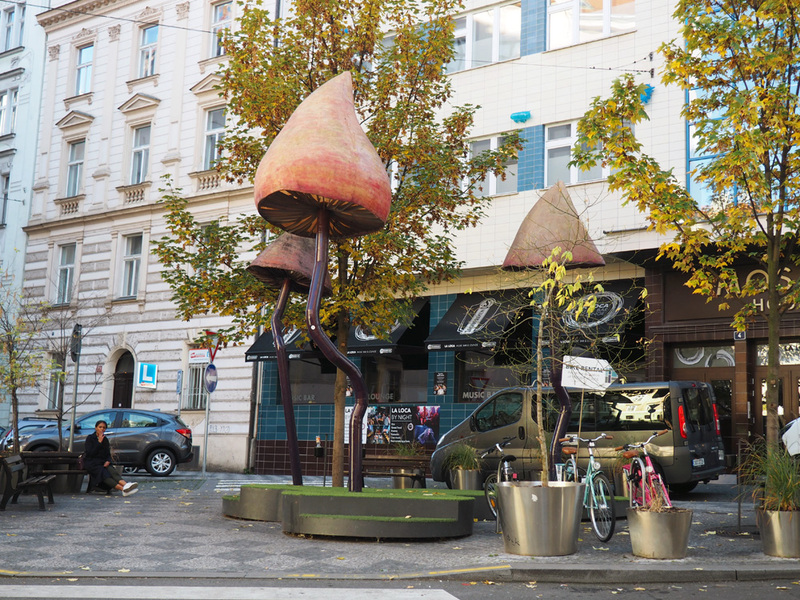 A whistlestop tour of the area revealed the statue of a Mary Poppins style man, flying with an umbrella, and some mushroom sculptures. Because, why not! 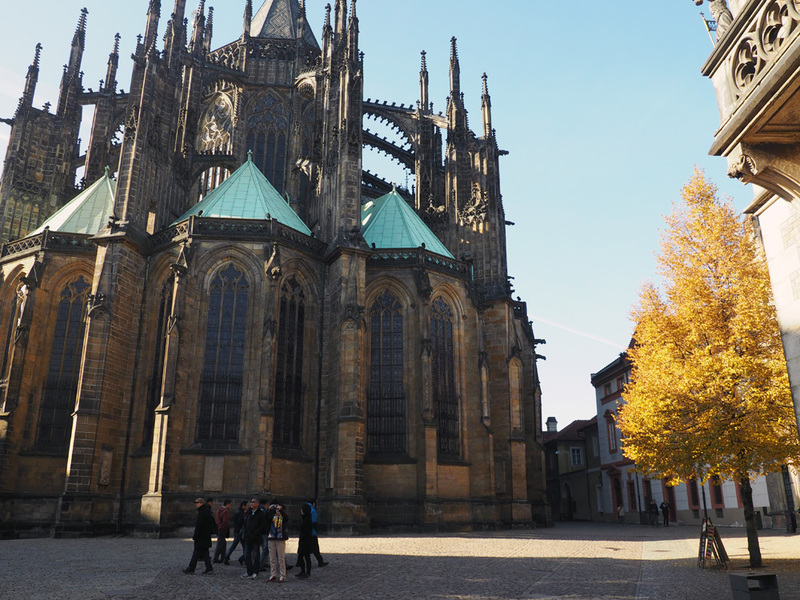 I really enjoyed my time in Prague – the city is incredibly picturesque and charming. It is incredibly touristic and from what I’ve heard, busy pretty much year round. I was surprised at how busy it was, on a weekend in November! For me, a long weekend was plenty of time to experience Prague. 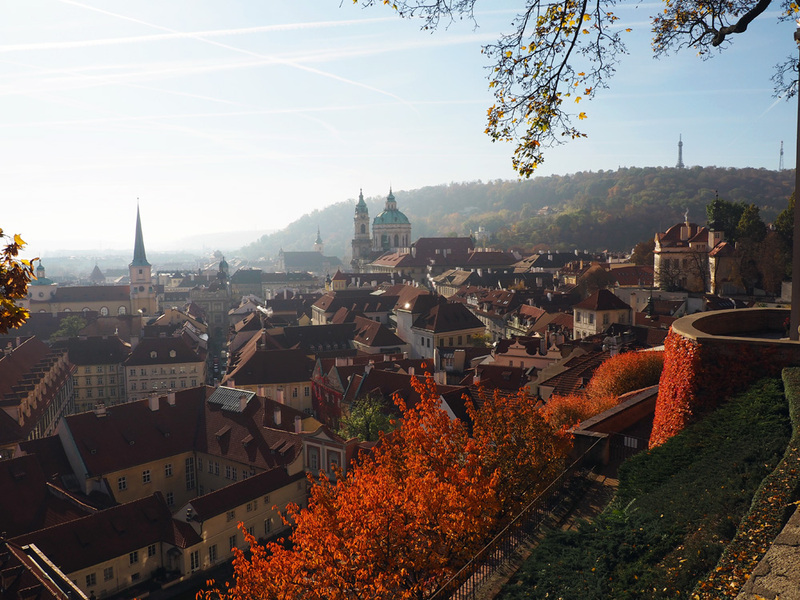 Have you ever been to Prague? What did you think of the city?